Forever One Moissanite station necklace featuring seven 3mm round brilliant cut Forever Moissanite stones. Each stone has the DEW of 0.10ct and each stone is set into a handmade bezel in the metal of your choice. Our Forever One Moissanite station necklaces are available in 14kt white, yellow and rose gold in 16 or 18 inches. This classic necklace should be a staple in your wardrobe. 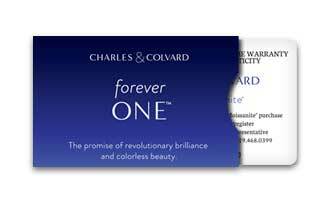 All of our Forever One moissanites are created by Charles and Colvard and each piece comes with a Forever One lifetime warranty card.